Get notified when The 1975 tickets are available! 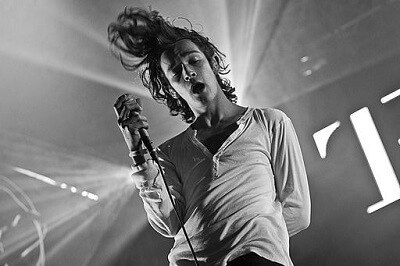 An English rock band out of Manchester, the 1975 is a group that is made up of Matthew Healy on vocals, Adam Hann on guitar, Ross MacDonald on bass guitar and George Daniel on drums. They met at the same high school in 2002 and chose the name of their band from a Jack Kerouac beat poetry book. They debuted their self-titled album in 2013 by way of Dirty Hit and Polydor which hit the top of the UK Album Chart that same year. Their second album, “I like it when you sleep, for you are so beautiful yet so unaware of it,” was released in 2016 and once again hit the top of the UK Chart as well as the US Billboard 200. See them live by buying your The 1975 tickets above.